The TraceParts engineering community receives monthly updates about the latest CAD models available from our platform as well as industry-related news. We have now also made it possible for you to add Text Ads in our catalog newsletters. Text Ads are seamlessly integrated in the news section of this newsletter. Your message will be more effective and well received, since readers do not consider it as a direct ad and it does not interrupt the flow while reading the newsletter. 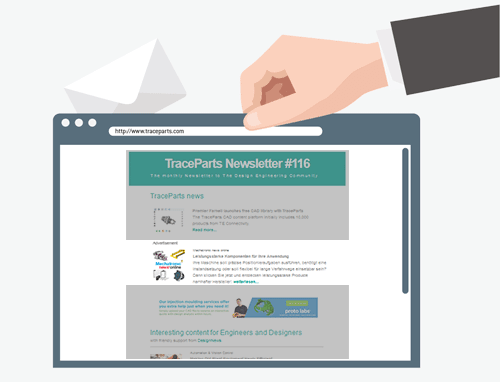 The TraceParts Newsletter is published every month on www.traceparts.com and sent by email to 540,606 engaged subscribers worldwide. IVW certified, the first and only CAD catalog portal to be audited by the IVW German independent certification agency.